This product has been discontinued and has been replaced by the DPH1. 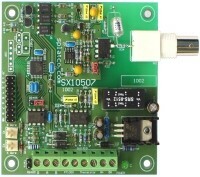 The SX10507 provides measurement of pH or ORP. It is an Xwire peripheral, compatible with all current SPLat controllers and future SPLat NG controllers. The picture on the left shows the BNC style probe connector. 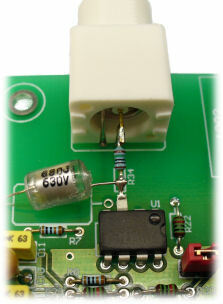 You will notice that the attached component leads have their connections off the printed circuit board. This is not untidy engineering on our part, it is necessary to provide the ultra high amplifier input resistance required for accurate pH measurement. Glass pH probes (by the way, we don't supply probes) have an output resistance of up to 800 MegaOhms. The amplifier must have an input resistance orders of magnitude higher than that to preserve accuracy. The amplifier chip we use in the SX10507 is a National Semiconductors LPC661IM premium device. It has a worst case input current of 4pA, equivalent to an error of about 0.05 pH units. The fibre glass of the printed circuit board is a good insulator, but not that good in relation to the ultra-high impedance levels in this situation. Air is a much better insulator, so that's what we use! Hence the "air wiring" of the input circuit. You can also see that we have used a high quality, ultra-low leakage polystyrene (aka expensive) capacitor for the input noise filtering. Because the electrodes are glass they have a very, very high resistance. This means that the measuring circuit must have an ultra-high input resistance so as not to upset the accuracy. The SX10507 has an ultra-ultra high input resistance and temperature measuring circuitry. There's an excellent, more detailed description of pH probes here. In a laboratory benchtop situation you would typically measure the pH of a liquid sample in an electrically insulating glass or plastic beaker, using perhaps a battery powered pH meter. In such a case the only electrical connection between the fluid and the measuring electronics is at the probe. Outside a nice, controlled laboratory environment, if you want to measure the pH of a flowing liquid in a metallic vessel or pipe, using line powered electronics (say a SPLat controller), it gets a lot messier. The fluid will be in electrical contact with ground/earth, and in all probability so will your electronics. Unfortunately, multiple ground connections (earth loops) more often than not give rise to electrical hum and noise. This interference will lead to errors in the measurement. In the SX10507 we have included electrical isolation between the pH probe and the digital interface to the SPLat controller. This uses a transformer isolated DC-DC power converter, and an optical data isolator, to ensure there is no metallic (ohmic) connection between the pH probe and the controller. This isolation eliminates the interference that can be caused by ground loops. The SX10507 is therefore suitable for industrial pH measurement, unlike cheap, non-isloated pH amplifiers. We have written a full-featured SPLat application program that converts an MMi202 controller with an SX10507 board into a complete pH measuring system. Download pH measurement program.